Widescreen vs. Fullscreen: a comparison of close-ups. Before I post the next three Gorgoroth entries I want to explain why I seem to be repeating myself. The long-time viewers of these entries will know I already presented the Gorgoroth scenes (except the waterskin scene) last August. But I fell in love with poems by jan-u-wine I hadn't seen last year, poems set in Gorgoroth, and I wanted to post them. To do so I needed images. 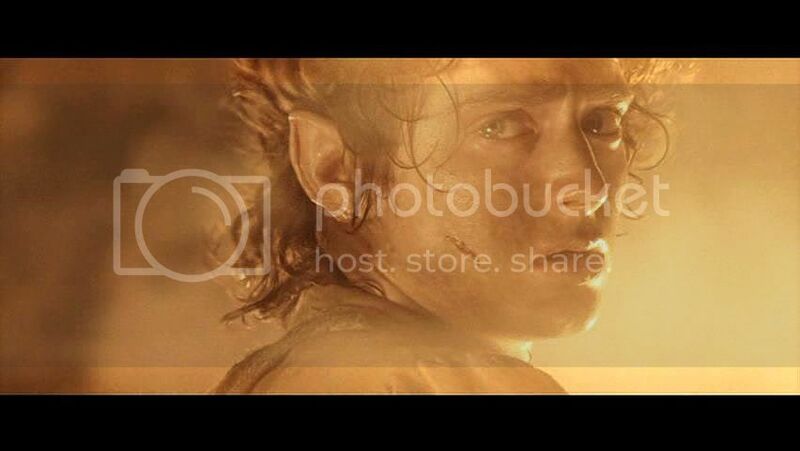 I love how jan-u-wine's poems illuminate screencaps (or Frodo manips), and visa-versa. I decided to re-cap the Gorgoroth sequences, but using the widescreen edition. That way more of Sam would show, since the poems have to do with Sam as much as Frodo. Last year's caps were made from the fullscreen edition, focussing almost solely on Frodo. Fullscreen is great for showcasing one actor, but widescreen is better for multiple-character scenes. Because I ended up with two sets of caps of the same scenes, I couldn’t help noticing the difference between the two formats. All these years of watching movies on television, or renting VHS tapes, I mostly have been watching what are called “fullscreen” versions of films. By “fullscreen” the makers mean, “full TV screen”, not the screen at a movie theatre. Until recently, a TV screen’s shape was rather like a square. Movie screens are far more rectangular. New flat-panel TV’s have a more rectangular screen, but not [yet] as elongated as the screen required for an ultra-widescreen movie (like LotR). I suspect fullscreen, as a format option, will soon be unavailable, as obsolete as the tube-style TV screens it was made to fit. 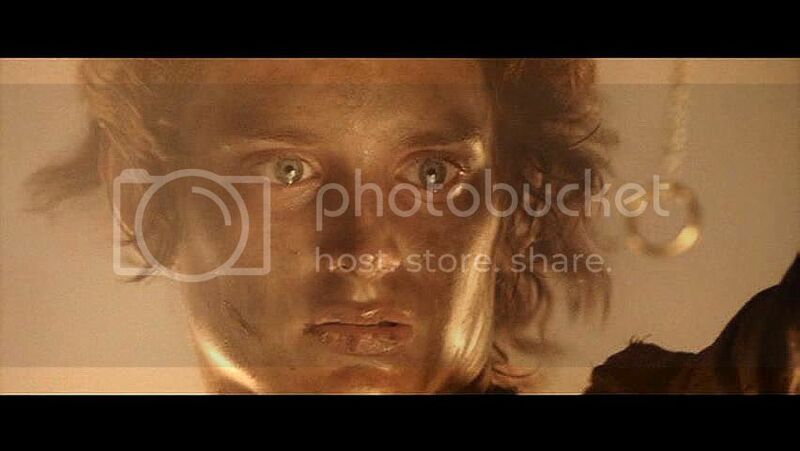 Before I began making Frodo screencaps, I had assumed the fullscreen version (“this motion picture has been formatted to fit your television screen”) was achieved simply by paring the sides down from the wider theatrical version. This turns out not to be true, or not true in every case. Sometimes the fullscreen version offers more, not less, of the original image. Below are sets of identical screencaps from the Gorgoroth and Sammath Naur scenes. As you will see, it is not always the case that the fullscreen version is made by enlarging the theatrical (i.e. widescreen) version, then cutting the sides off. The Sammath Naur scenes show the difference most clearly. Since I am not planning to present them in my Sammath Naur entries (I will be using the fullscreen version), I haven't cropped them. They still have their black bars (top and bottom). The widescreen caps for the Gorgoroth scene, as can be seen, have been cropped and trimmed, as I always do before posting them into an LJ entry. Looking the other night at the Sammath Naur pairs—with their uncropped widescreen black bars in place—it became obvious that what is done to convert regular widescreen into ultra-widescreen is to crop the tops and bottoms off the original frames, creating a super-elongated frame. The black bars aren’t just stuck onto the original images, they actually mask part of the frame, hiding the original image top and bottom. Realising this, I remembered moments in the DVD extras when Peter Jackson and Andrew Lesnie were talking about the composition of shots and looking into the viewer. There would be a grid of lines superimposed on the camera’s viewing window. The grid must have indicated the part of the frame that would actually show in the ultra-widescreen format. What this means for the screencapper, or those who just love to see the actors' faces at their biggest and clearest, is that the fullscreen format provides the best head shots of any character. Their faces are literally larger, filling the TV screen from top to bottom, creating closer-looking close-ups. And, in some instances, they actually show more than is visible seen in the widescreen version. I will demonstrate. In the first pairs of frames below (1-6), it is clear that the fullscreen format is made first by blowing up the original image until it fills the [TV] screen from top to bottom, then cutting the excess off the sides. The effect of this is remarkable to me. Although the fullscreen and widescreen frames feature exactly the same face, with exactly the same expression, they look very different to me. Perhaps because I literally can see the face better, I feel as though I can tell what the character is thinking and feeling better. The sheer size of the image makes a difference, too. The very bigness of the image implies greater depth, complexity, and emotional intensity in the character. 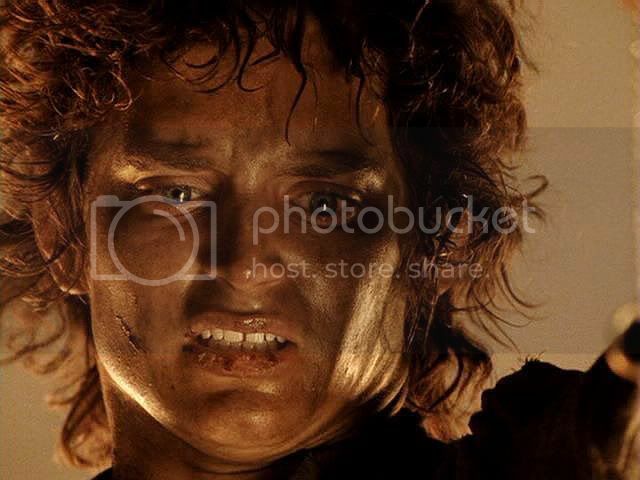 I suppose filmmakers have for ages used close-ups to achieve this effect—intensifying the viewer’s experience of the character’s thoughts and feelings simply by bringing the camera closer. The picture is so big, and so close, the face of the character is literally “in your face”. No wonder actors covet these shots. Even their acting looks more impressive, even though they are doing the exact same thing in the smaller, more distant images. You are right, I think, in what you say about the close-ups. But it isn't as easy as that, I think. That is, if you say 'the close-up brings us closer to the emotions of the character because we are "in his face"', you are, of course, stating an observable truth. But the close-ups also cut out most of whatever else would normally be in our line of vision. All we see is the character. It's sort of like distilling the moment, narrowing it until all we CAN see is that emotion. Unlike real life, where we see the "panorama" of the "shot". This was a great observation. In the first set of pairs, once the image is enlarged to fill the TV screen format, almost all the sides have to be cut off for the resulting close-up. The character's face is virtually all that remains of the frame. The setting is made unimportant, even non-existent. In the second set of pairs below (7-10), the effect is different. The fullscreen version’s image is not blown up; the face is the same size as it is in the widescreen frame. But the fullscreen version provides more of the original widescreen image--the print under the black bars has been restored. This must be what filmmakers who want to use an ultra-widescreen format have had to do in order to get a really close close-up. Cropping off the top and bottom of the frame, they sacrifice part of the actor’s head, even part of his face. Only the speaking area of the face--the eyes and mouth--is left. 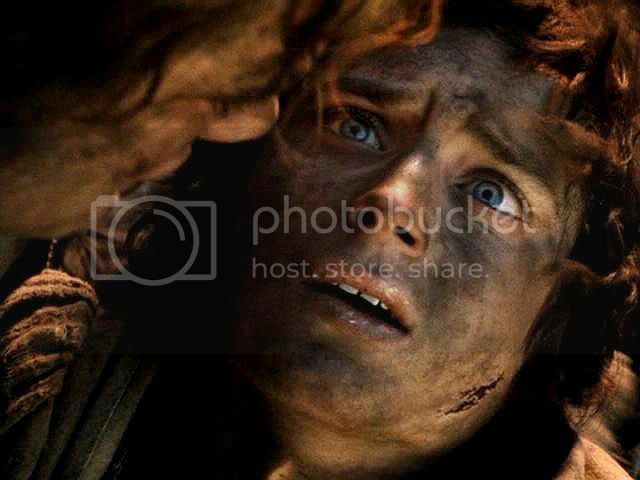 (In "Go home, Sam" scene, Jackson pares the frame down to only Frodo's eyes.) When the top and bottom of the frame are restored, bringing back the forehead, chin, and the way the head sits on the character's neck and shoulders, I think it changes the look and/or expression of the character, even if subtly. Well, then, on to the exhibit! In every pair, the widescreen version appears above the fullscreen version. As usual, I have tweaked all the caps, bringing up the light and sharpening the focus in each. I did not alter the sizes of the frames, fullscreen or widescreen. The images are the size the screencapping program makes automatically. The Gorgoroth widescreen images have been trimmed of their black bars, as well as a little of their width to make them fit better into LJ. 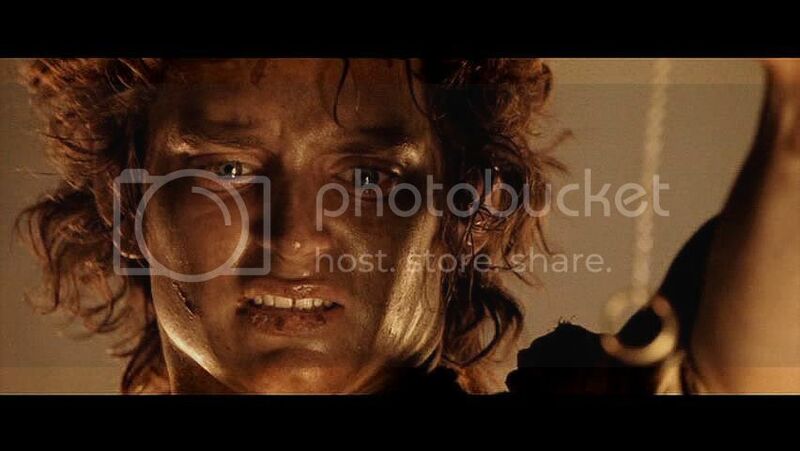 But the Sammath Naur widescreen caps have not been cropped or trimmed at all. ~ All ROTK screencap entries. Me, too! This is a bit of a revelation, to realize that there are parts of images that I never get to see. I had no idea! So, in these pairs of screencaps, the first cap is widescreen and the second cap is fullscreen ... yes? Yep, widescreen's the wide one, fullscreen's the tall one. But they're both cool. Sort of like at a seafood restaurant; I can't choose at the expense of the other: "I'll take the platter!" Hi, Not alone! They are rather gorgeous, aren't they? I love scrolling through them myself. Good morning, Mews! Yes, I was astonished, really, at the difference between fullscreen and widescreen in terms of the effect the image has on the viewer (me). 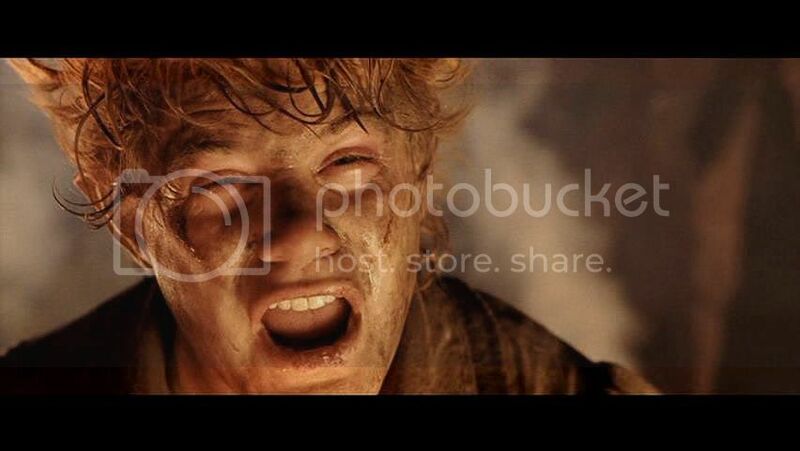 I wish there were fullscreen versions of the EE editions of LotR, since the EE's have become my standard viewing choice. I try to watch the fullscreen editions all the way through, but, except when they are being broadcast on TV in fullscreen (and I have no option to switch), I always stop about half an hour into the films and switch to EE. I miss too many of the new and extended scenes to watch the theatrical versions anymore. 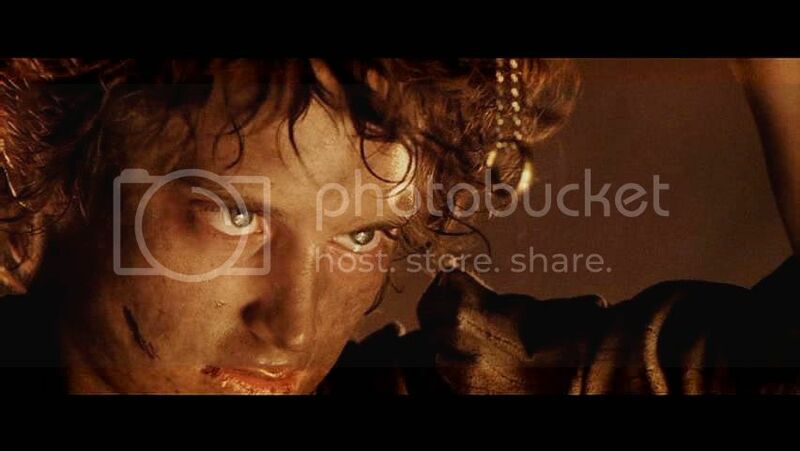 But I really do love watching the characters in big close-ups that fill the whole TV screen, Frodo especially. Not to sound too Valley Girl-ish, it's awesome! Mechtild!!! You opened me wholly new possibilities to see the Trilogy in a different way. Your comparison of fullscreen and widescreen is very enlightening. I haven't seen the theatrical version on DVD from a long time, and maybe never in fullscreen. I have always avoided LotR in TV because of the incredible number of commercials that make me crazy. Now I'm curious to try the fullscreen version to see the effect of the enlarged close-up on the story narration. The screencaps that you show in their double version have on me a very different impact. While the fullscreen intensifies the attention on the character, the widescreen seems more three-dimensional. They convey two different messages: plain human emotion the former, an emotion in the story background the latter. In particular this is evident in screencaps n. 6 with Sam, the two versions give me different feelings. The impact of fullscreen is more hard -and frightful- because I can't contextualize Sam's shout in the background. Thank you for let me discover new unespected content in PJ's movies. Thanks for commenting, Estelanui! You really should watch the fullscreen version of any of the films sometime. I think they now are very hard to find, however. I just looked on Amazon in order to link a picture of the cover, but there weren't any for sale. When you watch LotR on TV, there are a ton of ads, you're right. I was lucky enough to see FotR and TTT over and over again while visiting my mom at the time RotK came out. One of the satellite TV channels, with no ads, was showing the first two films over and over the week and a half I was there. I got to be very attached to seeing the huge images on her big TV set late at night. As for there being no visual context for the close-ups, you're right of course. But when you are actually watching the film, you still will be involved because the context is provided by the sequence, the film scenes in action. Even if the close-ups are very tight in the Sammath Naur or on Gorgoroth, for instance, you see the action and setting between these moments, which puts the close-ups in their proper narrative and emotional context. When you look at the caps above, you're looking at frames seen in isolation. They don't *feel* estranged from the film when you are actually watching them as visual narrative, happening in time as the film rolls. The real drawback to fullscreen is that you lose the sense of panorama, and scenes with a number of characters are very truncated. If the characters are strewn all across the screen, actors are actually cut out, the editors focussing only on the speakers and persons giving specific reactions. Amazing watching both screens interplay. In most it seemed sublte except for the intensity drawn closer in full screen. But 1 and 5 were so beautiful in wide screen. It didn't matter the difference. The intensity of his moment was there either way..and yet they were different. I can't imagine what they were thinking...the editors...when they looked at these shots. When PJ looked and had to have been totally enthralled with what he brought...what Elijah brought and what Sean brought to the screen...but especially Elijah. 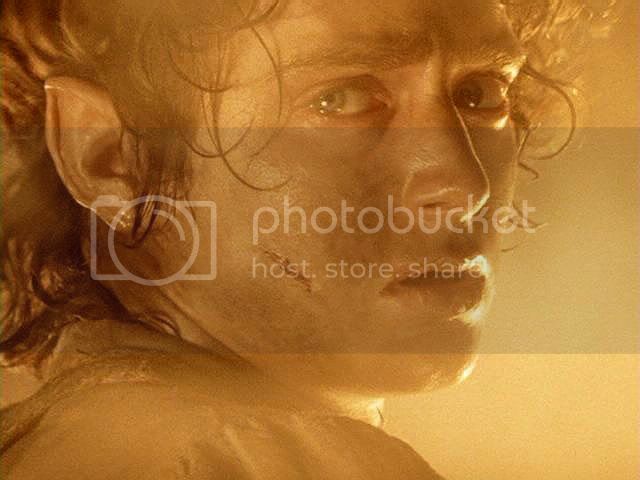 He made Frodo so beautiful that he ate into your soul. Elijah gave to the screen. In ROTK I was totally in love with the beauty in his suffering. The differences in him from then FOTR to ROTK. We know they weren't different in terms of time because shots were interspersed. But the actor conveyed it..gave what his superiors wanted. He was perfect. The differences between the screens in the end don't make much difference except in terms of noticing those differences..which is fun to notice and the reasons for doing them. 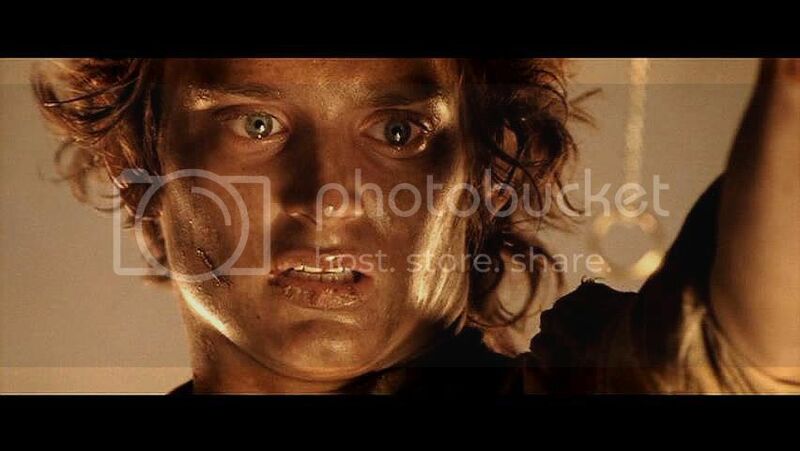 But either way...Elijah's Frodo never diminished from one shot to the other. But the tears, the sweat and the look did become more enhanced in full screen. I also have to mention that I have the FS and WS of both. I noticed these differences because of what was cut out of WS but how much I loved the facial intensity of FS. 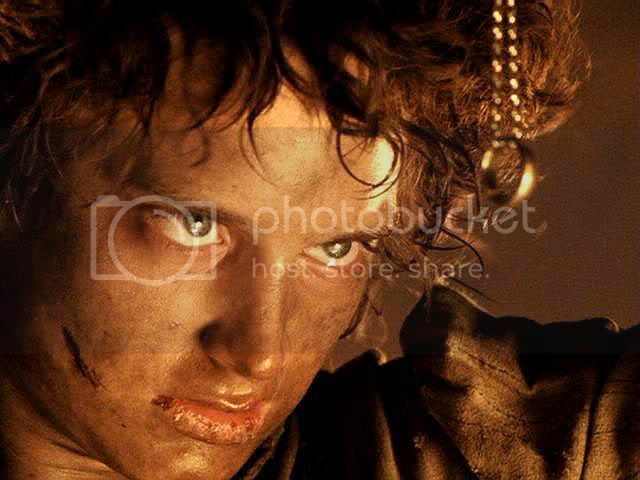 I went back and forth because its hard to give up Frodo FS face..but then there is more you get surrounding him in WS that adds to the moment. But...sometimes I just had to hit the focus buttons on my WS versions to get my closup of that gorgeous vision and emotion. You have the fullscreen versions? I really love watching them, I confess. Not just for Frodo--though mainly for him--but for all the characters. They all get close-ups, and their close-ups in the fullscreen version are as good as they get in home viewing. You say there is a "focus" button on your TV that allows you to look at your widescreen DVD in close-ups? Maybe we have that, too. Is it on the menu, accessible on the remote control? I must try and find it! P.S. 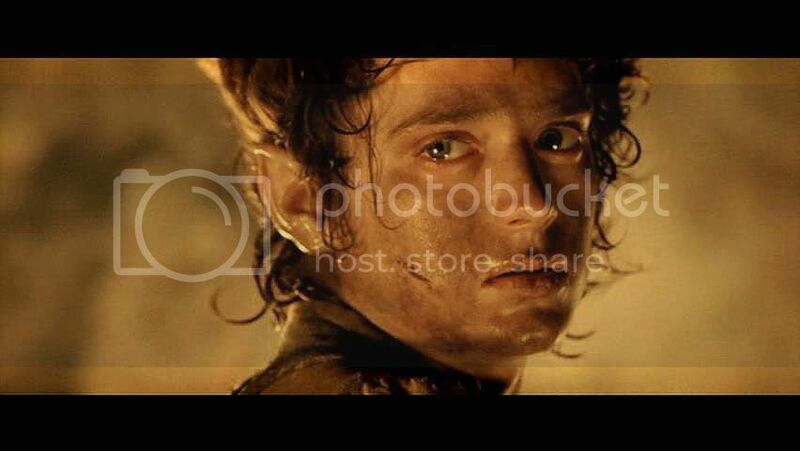 I agree that Elijah Wood did a fantastic job playing Frodo when filled with angst and suffering. I have been disappointed, perhaps, in his subsequent films because his roles simply haven't measured up. I knew he'd never get another role like Frodo, but I thought he'd get other roles that were similarly compelling, if in different ways. Alas, I am still waiting. But "hope springs eternal", they say! yes..I have both..and when I realized there really was a difference I was going back and forth because there were things I loved from both viewings. I really loved FullScreen because I love to catch the intensity of their emotions. But there where times I realized I was missing a peice..that was in the widescreen when I viewed it. Its a "Zoom" button and usually magnifies in 3 variations. Its very close to full screen but not quite. 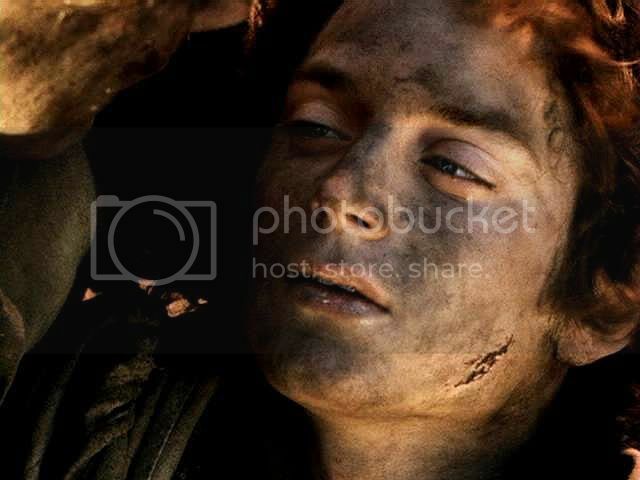 But I did that in full screen too...just because I was so ate up in Frodo's face. I love many moments..all the characters really. I watched them last weekend on TNT cable. Actually the one moment I cry every time for is when Theoden dies. I love him...his nobility and honor. His love for Eowyn and the final goodbye. I always have silent tears on my cheeks. This role for Elijah will be the only one, I think, like it for him. It was fantasy meant to draw out the beauty of a beautifully written subject. Fantasy seems to do this. He isn't striving for much more now and I think he seems to distance himself from that. He has known the greatness and been blessed in a good experience. Just as Will Turner is to Orlando..it was perfect for him. (Legolas was too..but those scenes with Orlando in POTC3...welll...phew and melty and emotional..beautiful). 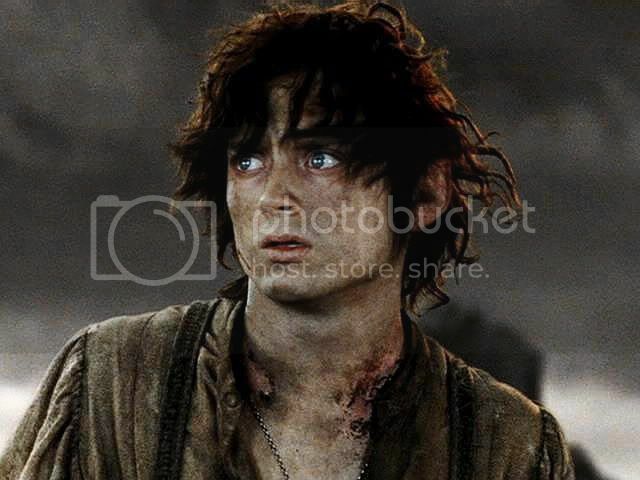 xoxox love this..love Frodo..love what you've done. ps...have you done the eagle scene? This is one of my alltime favorite moments...Rennaissance painting in true beauty. 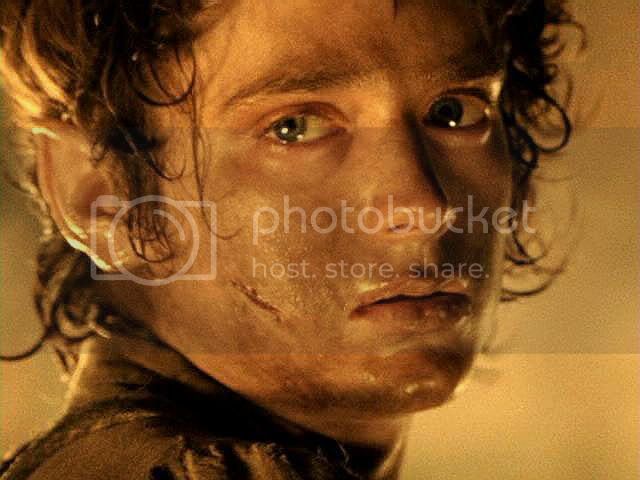 I can't get enough of Frodo lovingly held and the picture like an old world painting in perfect beauty. Thanks! I will look for the zoom button. I'll bet my 19 year-old daughter knows just where to find it, lol. I love so many scenes in close-up. The scenes in RotK, all of them, with Eowyn, just kill me, not just Theoden's death scene. 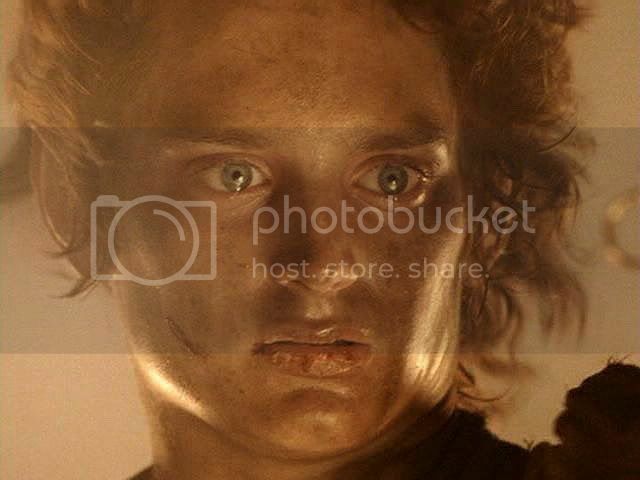 I love her scenes with Aragorn (the sharing of the cup and his dismissal of her before he leaves for the Dwimorberg), with Theoden up on the promontory at Dunharrow as the sun rises but she is without hope, her scene in the EE with Merry, her scene in the EE with Aragorn (her wave dream), and her EE scenes in the HOH being brought back to life by Aragorn, and then on the terrace with Faramir: OH, SWOOOOOON for the beauty and depth of such scenes! Yes, I have done the Eagles scene. 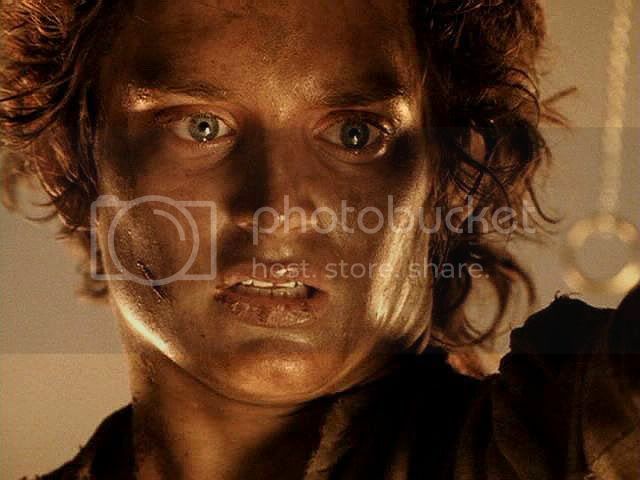 Just go to the link at the bottom of every screencap page that says "All Frodo and EW screencaps", or something like that. There is a list on it of links to the major sections of screencaps. Click the icon for RotK. On that page you'll see icons for the Eagles screencaps. They are from the fullscreen for the older entry, which has the most images. I did another entry in widescreen, with fewer caps, in order to feature a poem of jan-u-wine's. wow you probably was like "omg this is amazing to do" yet probably was like squealing every other second doing these very intense scenes. You are welcome, Periantari. It was a pleasure to make, and informative! I learned a few things. Bless you, Mechling, for this LJ entry. It’s true, you do learn something new every day. Hi, Estë! Thanks for dropping in at Mr. Beautiful Widescreen or Fullscreen Central. I thought I was going mad! 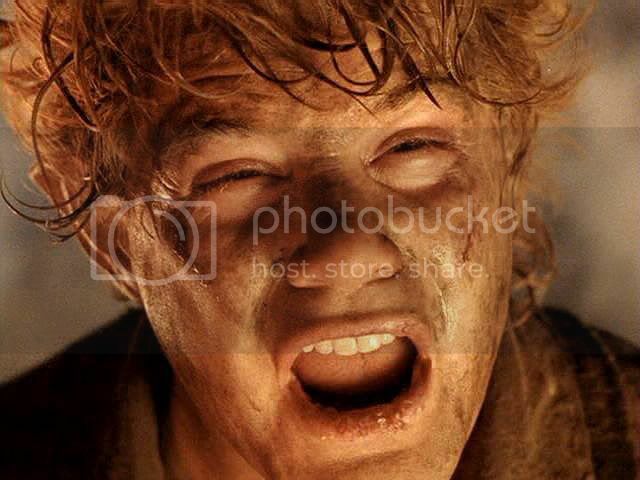 When The Fellowship of the Ring played on TV the other weekend, I noticed in the party scene that Merry and Pippin were on the bandstand behind Frodo, as ususual. I pointed them out to my sister who had just come back, we got to talking about them and I got up and tossed the widescreen theatrical edition in the DVD player and started it at the same scene during the commercial. The same scene except that Merry and Pippin were once again headless! I was outraged as I didn't remember seeing the scene with the cousins intact before! I hadn't realized that widescreen meant narrowing the image. Like everyone else, I had been trained to believe that widescreen meant more image. Re: I thought I was going mad! Ha! You're right! That's an instance in which it made a considerable difference, the restoration of the area under the black bars. I never really put the clues together--the difference between the two formats--until I made these sets of screencaps of the same scene. It really is subtle, and difficult to put your finger on until you see the frames side by side. So, no, Graymouse, you are definitely not going mad! Thanks for commenting. Wow, this was REALLY interesting! I had no idea - I always assumed they just cut off bits but that they might add something. Thank you for finding this out for us!! Thank you for finding this out for us!! That makes me smile, Frodosweetstuff. I sure do have a pleasant area of research!